Breaking free from worry, panic, and fear begins by shifting your perspective, allowing you to see anxiety from a completely different point of view. Once you see your problem from this new vantage point, it becomes easier to implement the strategy, break free, and live the life you desire. This book is transformational for healing anxiety. Instead of medicating yourself, you will learn a natural solution. Ken Goodman’s step-by-step approach, powerful tools, eye-opening metaphors, humor, and clever strategy, makes this coloring, self-help book easily understood by adults and teens. This is more than a self-help book. It also gives you the newest tool in stress reduction: adult coloring. Each chapter includes adult coloring illustrations which reinforce what you learn. The act of coloring has been proven to have a de-stressing effect. A study published in Art Therapy: Journal of the American Art Therapy concluded that coloring lowers anxiety. Stress melts away and you fall into a calm meditative-like state. More than a self-help book. More than a coloring book. The first ever coloring, self-help book. 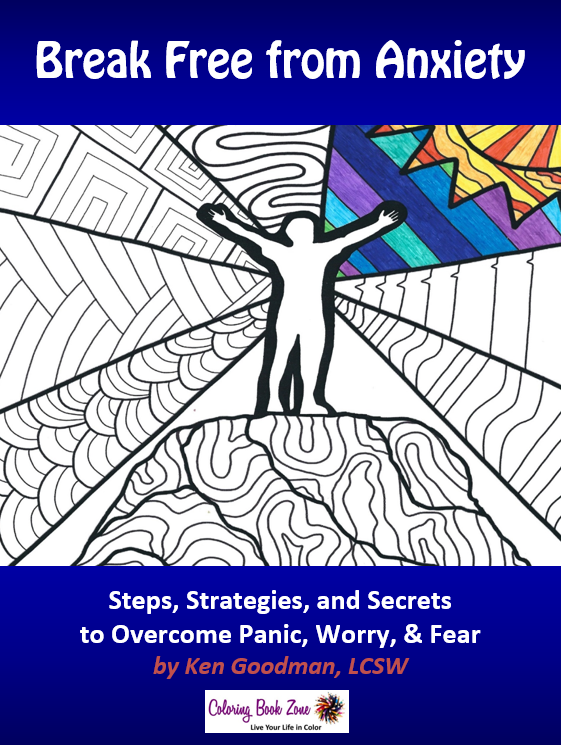 Ken Goodman has an exciting new idea - combine evidence based practices for relieving anxiety with the newly popular adult coloring (who many find relaxing and meditative). He combines the two in a well organized and thoughtful way, adding a dimension to the typical self-help book that makes it more engaging and exciting. Ken's experience in helping those suffering with anxiety and OCD is translated here in an easy to read and useful way. This book is a wonderful guide to living stress and anxiety free. Ken Goodman has found a creative way to navigate people through anxiety by finding engaging ways to teach them the skills they need, using fun examples, and coloring! I highly recommend this book for anyone suffering from anxiety. The variety of lessons and activities assist readers looking for concrete ways to better understand and manage their own anxiety. The chapters are presented with Ken’s creative, often humorous tone, and examples from his clinical practice. A fun, useful, engaging book! I often tell my graduate students that being creative is a quality you find in the best, most effective therapists. This innovative book helps prove my point. Ken Goodman couples his clinical expertise with dazzling creativity in his new work, Break Free from Anxiety. Ken Goodman's book is a creative, practical approach to overcoming anxiety. He offers a compassionate, imaginative, and at times lighthearted method to help solve this important issue in people's lives. The addition of "coloring pages" is a brilliant way to integrate both hemispheres of the brain in a therapeutic way. This book is a powerful resource for anxiety and I intend to recommend it to many patients... and do the coloring pages myself! Within these illuminating pages, you can quickly absorb the very best treatment principles we use today. And then, with Ken Goodman’s expert guidance, you will visualize exactly how you can put those strategies into action to win back your life!